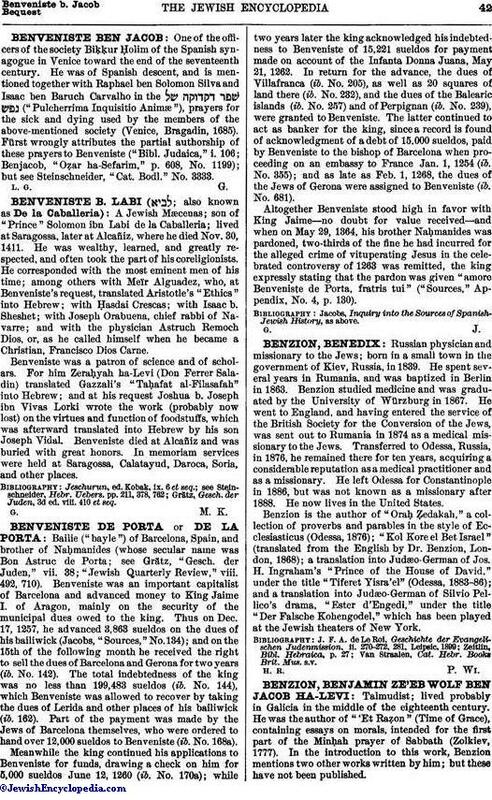 A Jewish Mæcenas; son of "Prince" Solomon ibn Labi de la Caballeria; lived at Saragossa, later at Alcañiz, where he died Nov. 30, 1411. He was wealthy, learned, and greatly respected, and often took the part of his coreligionists. He corresponded with the most eminent men of his time; among others with Meïr Alguadez, who, at Benveniste's request, translated Aristotle's "Ethics" into Hebrew; with Ḥasdai Crescas; with Isaac b. Sheshet; with Joseph Orabuena, chief rabbi of Navarre; and with the physician Astruch Remoch Dios, or, as he called himself when he became a Christian, Francisco Dios Carne. Benveniste was a patron of science and of scholars. For him Zeraḥyah ha-Levi (Don Ferrer Saladin) translated Gazzali's "Taḥafat al-Filasafah" into Hebrew; and at his request Joshua b. Joseph ibn Vivas Lorki wrote the work (probably now lost) on the virtues and function of foodstuffs, which was afterward translated into Hebrew by his son Joseph Vidal. Benveniste died at Alcañiz and was buried with great honors. In memoriam services were held at Saragossa, Calatayud, Daroca, Soria, and other places. Grätz, Gesch. der Juden, 3d ed. viii. 410 et seq.